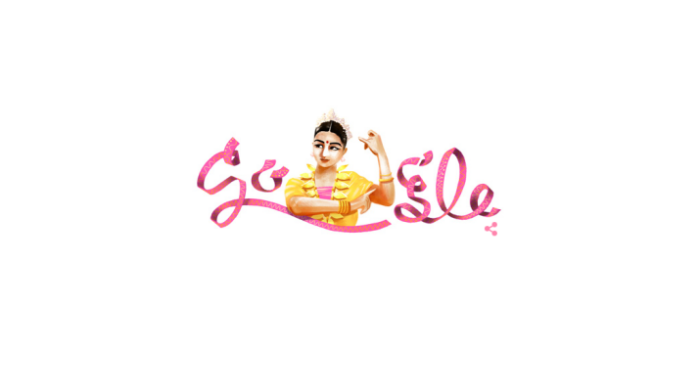 Google today paid homage to the well known Bharatnatyam dancer and choreographer Rukmini Devi Arundale on her 112th birth anniversary with a doodle. Rukmini Devi, born on February 29, 1904, in a Brahmin family in Madurai, was considered to be the most important revivalist in the Indian classical dance form. Despite strong protest, she not only supported this art form, but also took it to a higher level, which was considered a low and vulgar art in the early 1920s. Originally known as sadhir, the Indian classical dance form of Bharatnatyam owes its current name to E. Krishna Iyer and Rukmini Devi Arundale, who has been instrumental in modifying mainly the Pandanallur style of Bharatanatyam and bringing it to the global attention. It is also said that Rukmini Devi, in 1977, was offered to get nominated as a Presidential candidate by Morarji Desai, but she silently turned that down. She was honoured with Padma Bhushan and Sangeet Natak Akademi Award for her immense contribution to the Indian classical dance. With foundation of 'Kalakshetra' and being associated to the 'Animal Welfare Board of India', Rukmini Devi also remained involved in social welfare activities. On other hand, to celebrate this extra day, which comes every fourth year, Google UK has got its doodle featuring hopping bunnies by artist Olivia Huynh.